Canares mini version 110-ohm AES/EBU Digital Audio Cable features 25 AWG conductors great for shorter runs and use with common IDC Punch Down Block, Digital Audio "110-ohm Type" Patchbays. Integral drain wire for easy ground wiring. Other features include Twisted Pairs with <:95% Braid Shield and special PE Filler Rods to maintain constant 110-ohm impedance. AES/EBU Digital Audio Cable - single channel. 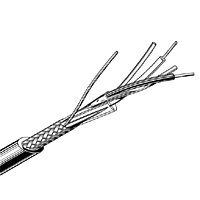 Conductor: 25 AWG, Stranded Twisted Pair Copper conductors for flexibility. Special PE Filler Rods maintain constant110-ohm impedance. Shield: >:95% Copper High-density Braid. Conductor DC Resistance: <:32.3 ohms/1000 ft.
Shield DC Resistance: <:6.8 ohms/1000 ft.